Digital 3D models are key components in many industrial and scientific sectors. 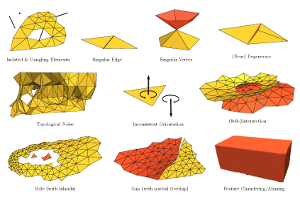 In numerous domains polygon meshes have become a de facto standard for model representation. In practice meshes often have a number of defects and flaws that make them incompatible with quality requirements of specific applications. Hence, repairing such defects in order to achieve compatibility is a highly important task – in academic as well as industrial applications. In this tutorial we first systematically analyze typical application contexts together with their requirements and issues, as well as the various types of defects that typically play a role. Subsequently, we consider existing techniques to process, repair, and improve the structure, geometry, and topology of imperfect meshes, aiming at making them appropriate to case-by-case requirements. We present seminal works and key algorithms, discuss extensions and improvements, and analyze the respective advantages and disadvantages depending on the application context. Furthermore, we outline directions where further research is particularly important or promising.